Outsider Art is one area of visual art that doesn’t usually get the attention it deserves. Generally defined as art by artists whom have not been formally trained through the art school system, Outsider Art encompasses several types of sub-categories. It is heartening, therefore, that this initiative is taking place to give some attention to this genre of visual art. Open to the public beginning March 15, Galeri Shah Alam will be hosting Lain Dari Yang Lain (translates to “Different From the Rest“), an exhibition featuring the works of 24 “outsider” artists, comprising naïve style, self-taught, and ‘outsider’ artists, which in the context of this exhibition refers to artists with learning difficulties of one form or another. Curated by independent Malaysian curator Tan Sei Hon, the exhibition is a collaborative effort by three galleries and an art collective, namely ourselves (Artemis Art), Lua Gallery, Galeri Titik Merah, and the Malaysia Naïve Art Group, with Sei Hon being the central coordinator bringing all parties together. This inaugural showcase aims to introduce to the public, art lovers, art practitioners and even art educators to a growing non academic approach to art-making. As opposed to the conventionally trained who create works for mostly professional and commercial reasons, these self taught artists create works out of pleasure, love and even inner necessity. The growing interests in the works by self-taught artists, especially in the west, are mainly due to their approaches and motivations which differ markedly from the academically trained and conventionally inclined. Their private visions, strange and wonderful landscapes and familiar longings materialized in their own special visual vernacular, offers us a glimpse of the hidden dimensions of the self free from the ideologies of standardization, strict formalistic considerations and conventional ideas of beauty. 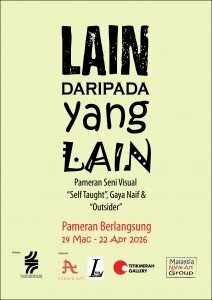 ‘Lain daripada yang Lain’ is a sincere and modest initiative to celebrate the works of the and spontaneous creations of the everyday people as a way to expand our general understanding of the visual arts and to embrace the genuine expressions of the untrained. 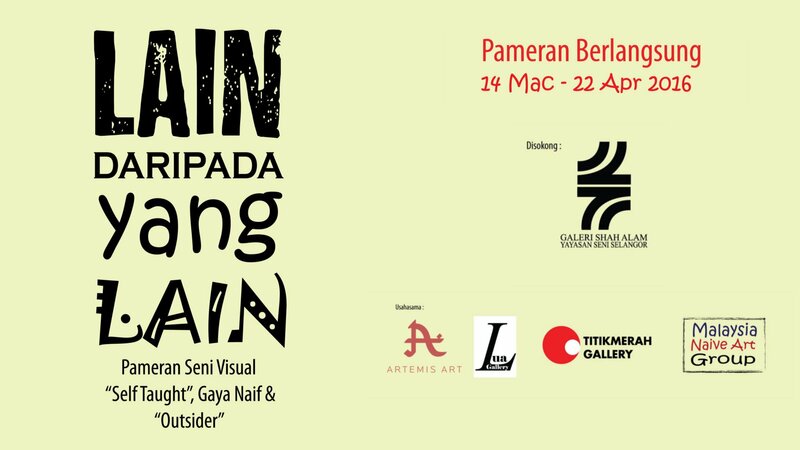 The official opening for Lain Daripada Yang Lain will be held at 12pm on 6 April 2016, officiated by Yg Berbahagia Dato Mahathir Lokman, Chairman of the National Visual Arts Development Board. Two activities will be held at Galeri Shah Alam on Saturday, April 16 2016, in conjunction with the exhibition, namely an art talk about local self taught, naive style and outsider artists (from 11 am to 12:30 pm), and a painting workshop later on the same day (1:30 to 4 pm) conducted by one of the participating artists. Note that a small fee will be charged to cover the materials used during the workshop. For more information about Lain Daripada Yang Lain kindly contact Galeri Shah Alam, at +60 3-5510 5344 or email them at [email protected].